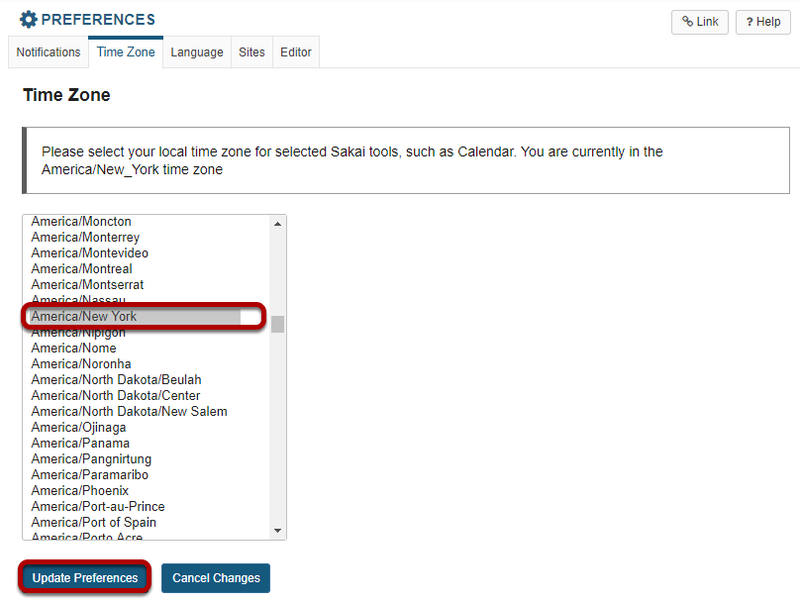 Sakai Guides and DocumentationSakai Basics HomeWhat is the Preferences tool? In Home, you can set preferences for how often you receive email notifications of site activity, set your time zone, and select your language. You can also hide sites from your list of active sites. Select the Preferences tool from the Tool Menu in Home. To customize your notification settings, click the Notifications tab. 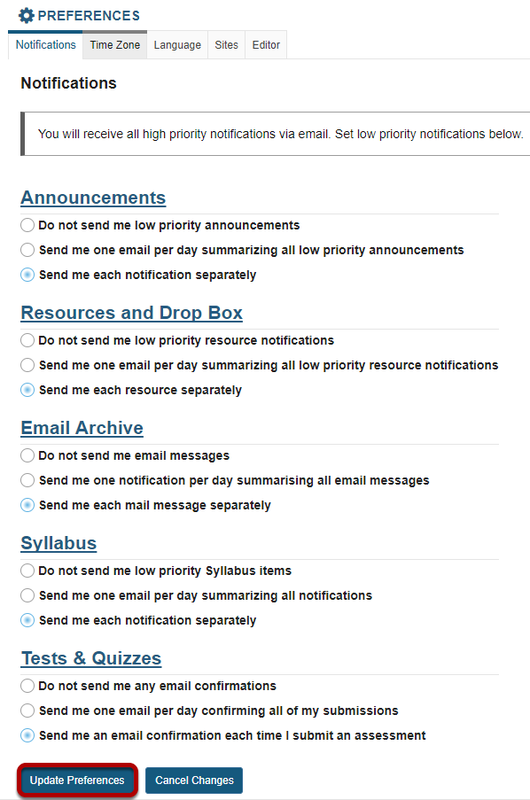 You may choose from the following options for low priority email notifications in the Announcements, Resources and Drop Box, Email Archive, Syllabus, and Tests & Quizzes tools. If you change any of these settings, click Update Preferences to save your changes. To set your local time zone, click the Time Zone tab. 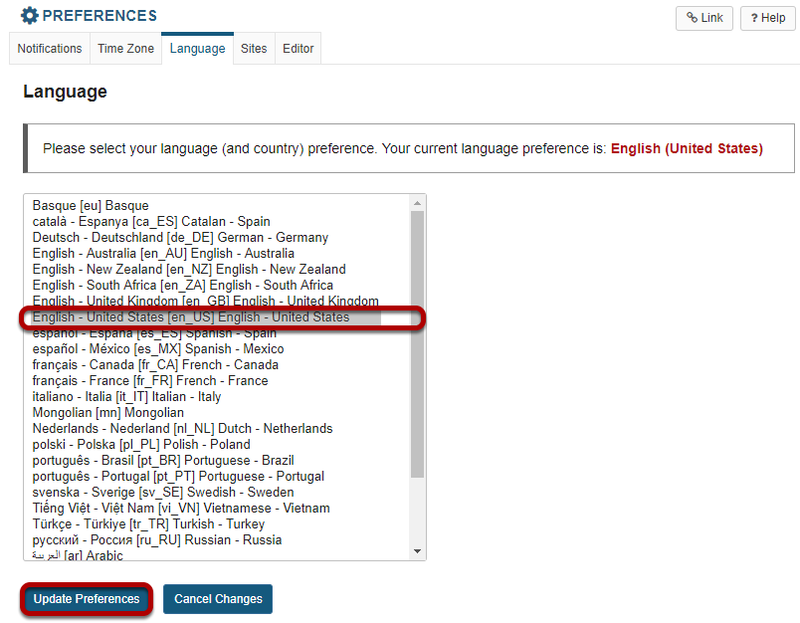 To set your preferred language, click the Language tab. The Sites tab allows you to select your preferred site tab display format, as well as hide sites from the site drawer. Select either Site Title or Site Short Description as the display format for the site tabs in the site navigation bar at the top of the screen. To hide one or more of your active sites, click the Sites tab. Hidden sites will show up in your list of all enrolled sites in tools such as Worksite Setup and Membership; however, they do not appear in the top navigation bar or in your Sites drawer. Note: Hidden Sites are still active in the system, and are still available to other enrolled users regardless of individual site display preferences. Select the sites you want to hide, then click Update Preferences. 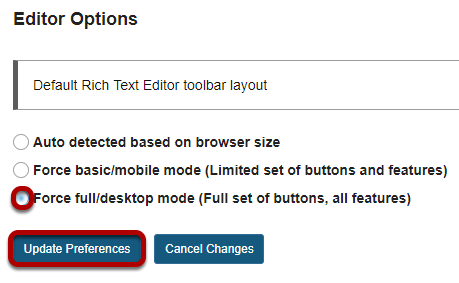 This tab allows you to set your preference for the Rich Text Editor toolbar throughout the system. 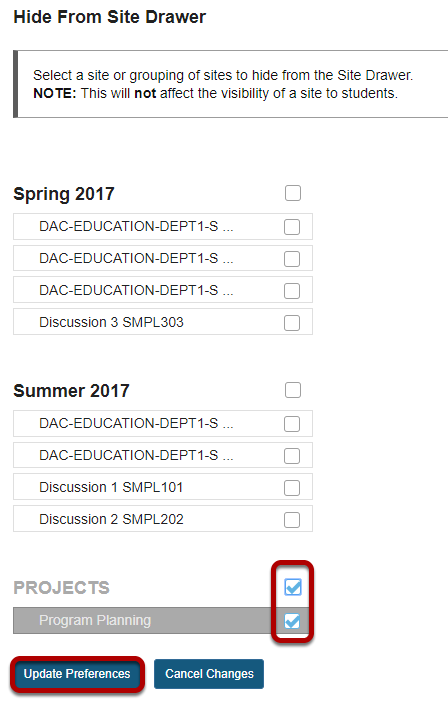 Choose your editor preference, then click Update Preferences. Next: What are the Resources in Home?